Background: Polymethylmethacrylate (PMMA) has been the most popular material for the construction of denture bases since 1937. This is largely due to its favourable although not ideal characteristics. Aims of the study: To study the structural characterisation using Fourier transform infrared (FTIR) of adding aluminium oxide (Al2O3) and silver nanofillers on heat cure acrylic powder treated with microwave radiation and microwave-treated PMMA powder ground by micronizer. Materials and Methods: PMMA powder was treated with microwave radiation at a power level of 360 watt for ¾ h. The obtained PMMA powder was then grinded using a domestic blender group (V). The next step is particle size reduction of the microwave-treated PMMA powder using micronizer group (M). Two concentrations of Al2O3and Ag nanoparticles (NPs) were added separately into untreated PMMA powder group (P) and microwave-treated PMMA powder group (V and M) compared with the control group. The structural characterisations of all experimental groups are determined by FTIR. The samples were divided into 15 groups, one sample for each group. Results: The FTIR analysis has confirmed that the structural behaviour of both microwave and micronizer groups showed that there were no changes in the regions of the band locations for C=C and C=O when compared with the control one. The infrared spectra of all acrylic groups with (Al2O3and Ag) NPs additives showed all of the unique peaks attributed to the PMMA. These bands appeared in the same regions of the acrylic except the carbon double bond carbon (C=C) were absent in the infrared spectrometer chart. Conclusion: The FTIR test charts provide strong evidence that there are no chemical changes in all experimental groups. Except for the C=C band from the methacrylate group did not appear in samples containing NPs, which in turn indicates that the residual monomer of these groups is remarkably decreased. One of the most widely used materials in prosthetic dentistry for the processing of dentures is polymethylmethacrylate (PMMA). This material is not ideal but has optimal properties such as its low cost, low weight and acceptable aesthetics that are responsible for its popularity. Microwave heating, which uses electromagnetic energy in the frequency range 300–3000 MHz, can be used successfully to heat many dielectric materials. The microwave is extensively accepted as an efficient and non-ionised electromagnetic energy source in several different fields of polymerisation reactions such as step-growth, ring-opening and radical polymerisations. Its specific heating method attracts extensive interest because of rapid volumetric heating, suppressed side reactions, energy saving, direct heating, decreased environmental pollutions and safe operations. More attention was directed towards the incorporation of nanoparticles (NPs) into PMMA to improve its properties. The properties of polymer nanocomposites depend on the type of incorporated NPs, their size and shape as well as the concentration and interaction with the polymer matrix. Fourier transform infrared (FTIR) spectroscopy is a very useful tool for molecular characterisation and for following chemical reactions. In particular, FTIR spectroscopy is a well-established technique to characterise polymers. PMMA powder treated with microwave radiation and grinded with micronizer, and the obtained PMMA powder is given the symbol group (V and M), respectively. Two concentrations (0.5% and 1%) of aluminium oxide (Al2O3) (α-phase) with an average diameter of 20–30 nm and silver NPs with an average diameter of 80 nm obtained from (Beijing Dk nanotechnology co., Ltd) were added separately into the obtained microwave-treated PMMA powder (group V and M) in addition to the untreated PMMA as a control group (P). To get uniform distribution of these NPs inside the polymer, the capsule of the amalgamator (Dentomat, Degussa, Type 600, Germany) was modified by attaching small covered plastic bottle, into which the PMMA powder and NPs are placed and the amalgamator turned-on for 1 min to ensure homogenises the distribution of NPs inside the polymer; monomer was later added according to the ratio recommended by the manufacturer. Acrylic plastic plate samples with a dimension of (10 mm × 4 mm × 4 mm) ±0.03 mm length, width and thickness, respectively, were prepared for this test., The FTIR spectroscopy was carried out by CL alpha-P FTIR spectroscopy in the University of Mosul, College of Dentistry, Department of Basic Sciences. Fifteen samples were prepared for FTIR with one sample for each group of the tested materials. The samples were scraped using a sharp knife to form small pieces of acrylic resin to obtain a clear FTIR spectrum. Then, 1 mg of the polymerised scraped powder placed in the sample beam of the spectrometer. The specimens were placed on the diamond set, and FTIR spectra of the samples were recorded and viewed on the computer device. In the FTIR charts, two important absorbance peaks appeared (the absorbance of the C=C bond from the methacrylate group which appear around 1636 cm−1 and the absorbance peak of the C=O from the ester carbonyl group appear around 1720 cm−1). 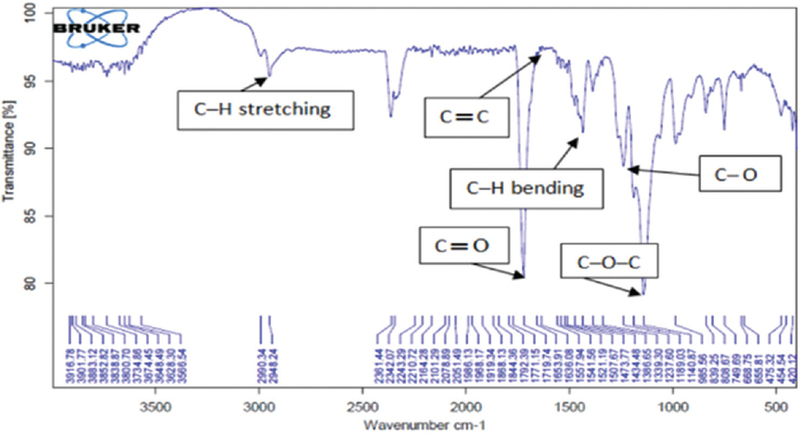 [Figure 1] shows the infrared spectrometer chart of the control acrylic group (P); a strong intense peak C=O stretching was observed at 1719 cm−1. There is a distinct absorption band at 1140 cm−1, which can be attributed to the C–O–C stretching vibration. Carbon-to-carbon double bonds C=C were observed at 1636 cm−1. 1237 cm−1 is assigned to C–O stretching modes. The band at 1434 cm−1 can be attributed to the bending vibration of the C–H bonds of the –CH3 group. The band at 2948 cm−1 can be assigned to the C–H bond stretching vibrations of the –CH2 group. The FTIR chart of groups (V and M) showed that there were no changes in the regions of the band locations for C=C and C=O when compared with the control one, as shown in [Figure 2] and [Figure 3]. The infrared spectra of all acrylic groups with (Al2O3 and Ag) NPs additives showed all of the unique peaks attributed to the PMMA. These bands have appeared in the same regions of the acrylic except the carbon double bond carbon (C=C) was absent in the infrared spectrometer chart as shown in [Table 1]. 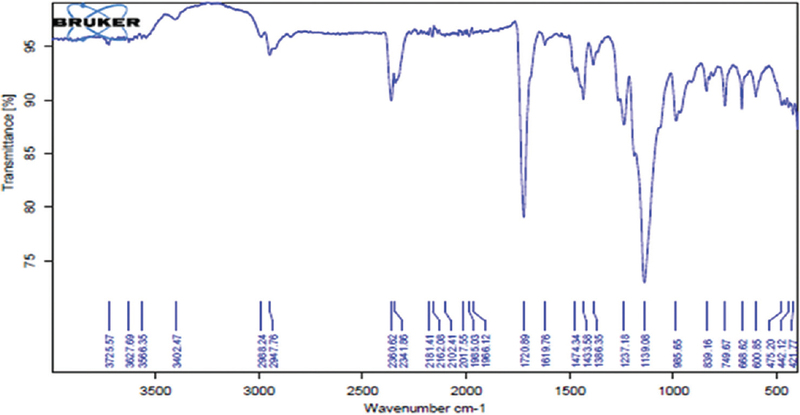 The band of NPs additives did not appear in the spectrum because the spectra of NPs appeared between 200 and 400 cm−1 and this bands out of the range of machine used. The FTIR charts for all the experimental groups are apparent in [Figure 4], [Figure 5], [Figure 6], [Figure 7], [Figure 8], [Figure 9], [Figure 10], [Figure 11], [Figure 12], [Figure 13], [Figure 14], [Figure 15]. The FTIR charts for the control group (P) and the microwave-treated group (V) showed that there were no changes in the bands location for the C=C and C=O of the polymer treated with microwave radiation when compared with the control one. These findings are in agreement with those of Taqa et al., even though increasing the exposure time of microwave radiation to PMMA powder in the present study. Further decreasing in the particle size of the heat cure acrylic powder group (M), the FTIR charts showed no changes in the bands location for the C=C and C=O of the obtained polymer group (M) when compared with control one, thus providing strong evidence that there are no chemical changes in the treated powder group (V) and group (M) when compared with the control group (P). In addition, there are no noticeable shifts in the peaks (in terms of wavenumbers) between the neat PMMA and the PMMA stabilized NPs, demonstrating that the interaction between the NPs and the PMMA probably occurs through a physical force rather than a chemical bonding. Based on the above discussions, it can be indicated that there are only physical interactions between the components and absence of any chemical-bond formation. The FTIR test charts provide strong evidence that there are no chemical changes in all experimental groups. Except for the C=C band from the methacrylate group did not appear in samples containing NPs which in turn indicates that the residual monomer of these groups is remarkably decreased. Ghafari T, Rad FH, Ezzati B. Does addition of silver nanoparticles to denture base resin increase its thermal conductivity? Beheshti Univ Dent J 2014;32:76-81. Bradshaw SM, Wyk EJ, de Swardt JB. Microwave heating principles and the application to the regeneration of granular activated carbon. J South Afr Inst Mining Metall SA ISSN 0038–223X/3.00 + 0.00: 201-10. Mallakpour S, Rafiee Z. Application of microwave- assisted reactions in step-growth polymerization: A review. Iran Polymer J 2008;17:907-35. Jordan J, Jacob KI, Tannenbaum R, Sharaf MA, Jasiuk I. Experimental trends in polymer nanocomposites – A review. Mater Sci Eng A 2005;393:1-11. Sakaguchi R, Powers J. Craig's Restorative Dental Materials. 13th ed. United States: Mosby Inc, Elsevier Inc.; 2012. p. 95-6. Bhargava R, Wang S, Koenig JL. 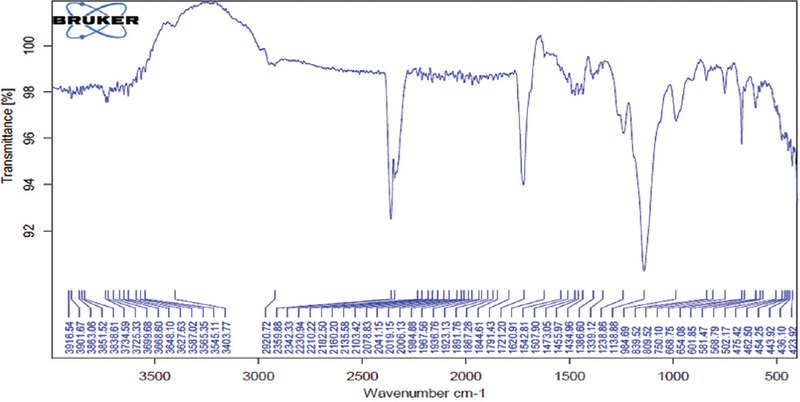 FTIR microspectroscopy of polymeric systems. Adv Polym Sci 2003;163:137-91. Coates J. Interpretation of infrared spectra, a practical approach. In: Meyers RA, editor. Encyclopedia of Analytical Chemistry. Ó John Wiley & Sons Ltd, Chichester; 2000. p. 10815-37. Moraes LG, Rocha RS, Menegazzo LM, de Araújo EB, Yukimito K, Moraes JC, Infrared spectroscopy: A tool for determination of the degree of conversion in dental composites. J Appl Oral Sci 2008;16:145-9. Obradović-Djuričić K, Medić V, Radišić M, Laušević M. Correlation between the degree of conversion and the elution of leachable components from dental resin-based cements. J Serb Chem Soc 2011;76:1307-23. Abdulkareem MM, Hatim NA. Evaluation the biological effect of adding aluminum oxide, silver nanoparticles into microwave treated PMMA powder. Int J Enhanced Res Sci Technol Eng 2015;4:172-8. Urban VM, Machado AL, Vergani CF, Jorge EG, Santos LP, Leite ER, et al. Degree of conversion and molecular weight of one denture base and three reline submitted to post- polymerization treatment. Mater Res 2007;10:191-7. Al-Bahar ZJ. Evaluation the effect of incorporated hydroxyapatite prepared from dried egg shell on some properties of denture base. Int J Sci Basic Appl Res 2014;5:1-90. Balamurugan A, Kannan S, Selvaraj V, Rajeswari S. Development and spectral characterization of poly (methyl methacrylate)/hydroxyapatite composite for biomedical applications. Trends Biomater Artif Organs 2004;18:41-5. 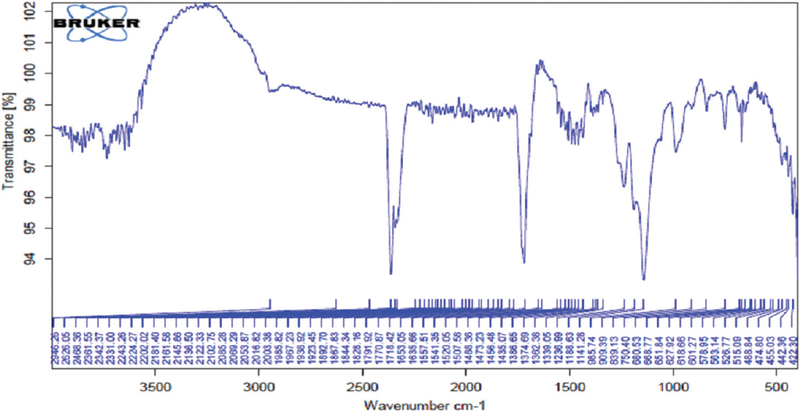 Hussain R, Mohammad D. X-ray diffraction study of the changes induced during the thermal degradation of poly (Methyl Methacrylate) and poly (Methacryloyl Chloride). Turk J Chem 2004;28:725-29. Duan G, Zhang C, Li A, Yang X, Lu L, Wang X. Preparation and characterization of mesoporous zirconia made by using a poly (methyl methacrylate) template. Nanoscale Res Lett 2008;3:118-22. Taqa AA, Hatim NA, Ebraheem SN. Evaluation of Microwave Effect on Dry and Wet Polymethyl Methacrylate. LAP LAMBERT Academic Publishing. M. Sc. Thesis Submitted to College of Dentistry University of Mosul; 2014. Otsuka T, Chujo Y. Poly (methyl methacrylate) (PMMA)-based hybrid materials with reactive zirconium oxide nanocrystals. Polymer J 2010;42:58-65. Taqa AA, Hassan ZJ, Hatim NA. Study the FTIR of hydroxyapatite additive to heat cured acrylic resin. Al Rafidain Dent J 2012;14:32-6. Akhavan A, Sheikh N, Beteshobabrud R. Polymethyl methacrylate/silver nanocomposite prepared by γ-ray. J Nucl Sci Technol 2010;50:80-4.